What should I do if I find mold in my military base housing? When you own your home, you make every effort to keep it in good repair and to make sure it is a comfortable and safe environment for your family. When you are leasing a property, the condition of the home is often out of your control because the landlord is responsible for major repairs. 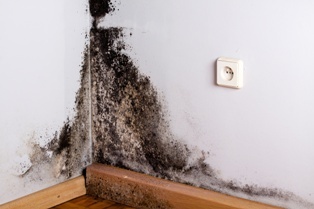 With most residential leases, renters have the law behind them in getting a dangerous situation such as the presence of black mold corrected by the landlord. However, when you are leasing a house on a military base from a private contractor, you may feel like you don’t have the same rights as a private citizen. I am here to assure you that you do have a right to safe housing and that mold growing in the home is definitely a serious problem for health and safety. These symptoms are often mistaken for other illnesses, but having your home tested for mold can confirm it as the cause of your family’s medical complaints. When military housing was privatized in 1996, management companies took over responsibility for houses on base from the Department of Defense. Toxic mold has been a recurring problem on bases across the country, from Camp Pendleton in California to Oceana Naval Air Station in Virginia Beach. Families have reported mold blooms across the ceiling, around air vents, under carpeting, and in bathrooms and basements. Their children have suffered from severe respiratory infections and asthma. Management companies such as Lincoln Military Housing have repeatedly shirked the costly job of mold remediation and have allowed their residents to continue to get sick. No matter where in the U.S. you are serving your time in the military, I can help you take on your landlord when you are struggling to get mold removed from your base housing. There are both federal and state laws requiring your landlord’s cooperation in providing you with safe housing or allowing you to leave without penalty and I will apply those laws to your situation to help you protect your family. Contact me online or call me directly at 855.982.2400.